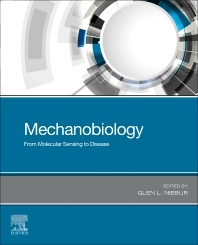 Mechanobiology: From Molecular Sensing to Disease provides a review of the current state of understanding of mechanobiology and its role in health and disease. Glen Niebur is a professor of Aerospace and Mechanical Engineering at the University of Notre Dame. He holds bachelor’s and master’s degrees from the University of Minnesota, and the Ph.D. from the University of California. Research is focused on orthopedics, including bone quality, damage mechanics of trabecular bone, mechanobiology of bone, hard and soft tissue constitutive modeling, computational mechanics of tissues, and genetic factors affecting bone quality. Current projects are investigating the interactions between microdamage formation in bone and the changes in bone porosity and structure that accompany osteoporosis. Osteoporosis results in changes at multiple levels of the hierarchical structure of bone, and these can either compensate for or enhance fracture risk. Medical imaging methods, especially computed tomography (CT) are used to image and quantify bone structures in bone samples and in live animals. A current project is using medical imaging to longitudinally monitor and understand fracture healing. Most recently, work has begun in the area of bone marrow mechanics, affects of aging and disease on bone marrow morphology, and interactions between bone and bone marrow.